What does one say about this magnificent church that hasn't been said before? I remember being told many years ago by an old Campdonian about a tradesman from Birmingham who came to Campden to undertake some work at the church. He returned to Birmingham saying he'd been all round the place but couldn't find it. When told he couldn't have missed it, because it was so prominent, he exclaimed, "I thought that was the Cathedral!" Unlike many other churches, St James is all-of-a-piece, no one part jarring architecturally with any other. This church is, of course, a product of the prosperous wool era, when Campden had one of the few 'Wool Staples', a body which governed the quality and price of the wool being exported, and thus it became home to rich wool merchants. 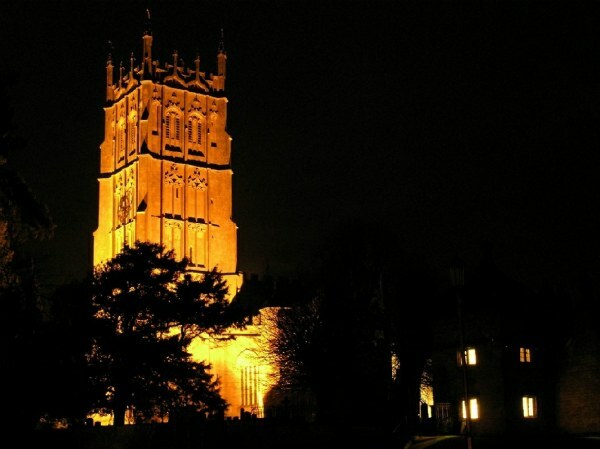 The best-known of these, William Grevel, built the superb building in the High Street that carries his name, and whose brass, the largest in Gloucestershire, lies in the chancel floor. These merchants gave generously to the church, transforming the humble Norman building into the glory we see today. Rather surprisingly, its interior is fairly plain, with clear glass in many side windows. However these and the clerestories let in plenty of light, such that details of the walls, columns and roofs can be seen easily. St James contains many treasures beyond the brasses. Principally these are the 15th.c altar hangings and the 14th.c cleric's cope on display under the tower (but both are covered to protect them from light), and Sir Baptist and Lady Hicks' tomb on the south side of the Chancel. The brass 'falcon' lectern, given by Hicks, is truly a jewel, as is the Flemish-style pulpit, another of his gifts. Externally, the delights include the Muniment Room above the porch, access to which is via a little door near the South entrance, and on the east wall of the porch is a memorial tablet to Jonathan Hulls. Who, you might ask, is Jonathan Hulls? He was the first person to be granted a patent (in 1736) for using a steam engine to power a boat. Unfortunately, it failed when tried on the Avon at Evesham, but in recognition of his foresight, his portrait hung (and may still hang) in a stateroom of the Cunarder 'RMS Queen Mary'. The great external gem is, of course, the tower, all 120ft of it. Unfortunately, it is something of a 'wobbler', moving perceptibly when the bells are rung. It was far worse when the bells were hung in the ancient wooden bellframe at louvre level, at which time they were a handful to ring (Oh! I remember them vividly�! ), but they were rehung in 1986 in a new metal frame some 15ft or so lower in the tower to improve handling and their effect on the structure. 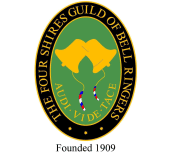 The bells are a varied lot, being the product of four founders. There were some proposals a few years ago to augment the bells to 10, but this foundered. Perhaps this should be revived with new vigour to provide a ring appropriate to the building containing them. If a 'lesser' church in the Deanery can do it, why not the 'big' Church...? The Guild has a practice here on Saturday Dec 17th (7.00-8.00pm), after which the Xmas Party will be held (see Notice).